When it comes to protecting your contents and keeping your workspace organised at all times, you need to implement a smart storage solution that combines mobility with advanced security features. If you’re looking for a cost-effective option that matches this description, take a closer look at the mobile drawer cabinets that we provide. 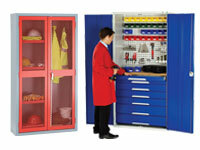 What Is the Purpose of Mobile Drawer Cabinets? Manufactured with your everyday storage needs in mind, these Bott mobile units are built to last and constitute a great choice for potential buyers interested in space-saving storage. Whether you need to file your documents with ease, or keep small appliances, tools and supplies within reach every single day, keep in mind that the our mobile cabinets ensure a more effective utilisation of space. You just need to keep one aisle clear to access your contents. The mobile units can be used individually or moved together to create the perfect storage solution with an optimal configuration. Due to their high practical value and great looks, the Bott mobile cabinets that we stock and sell are a fantastic option for virtually any type of indoor space, including offices and households. Given their versatility and sturdy construction, these mobile drawer cabinets are a safe bet for companies and individuals seeking a secure, reliable storage solution that they could move around with ease. The 780 mm tall models can be used and stored under workbenches, to help users save space and keep their tools and supplies neatly organized around the clock. Adequate for both commercial and residential use, the mobile drawer cabinets that we have introduced on the market are a great alternative for families and business owners interested in a storage option that ensures plenty of space, smart security features and the highest level of convenience. 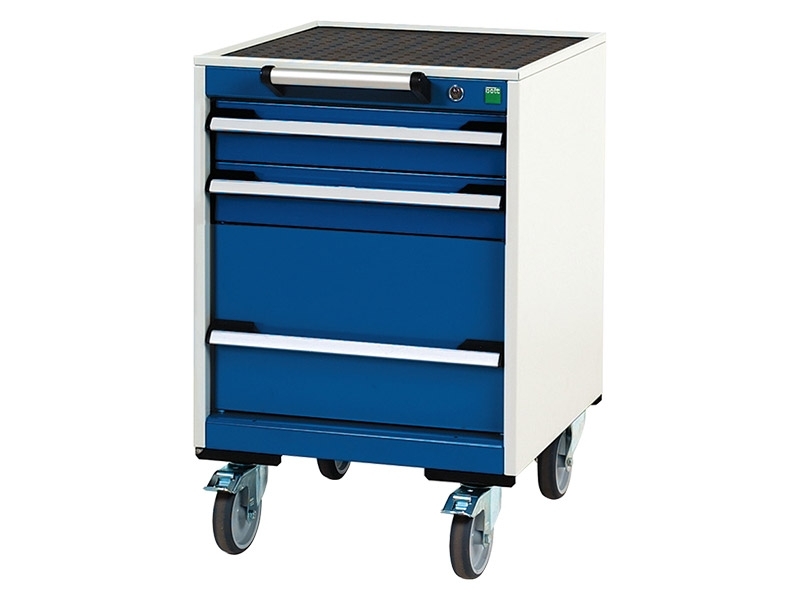 Each drawer can hold a weight of up to 50 kilograms, and the full-extension cabinet drawers come with safety, anti tip, interlock features to prevent accidents and guarantee optimal ease of use. With a total combined capacity of 300 kilograms, these products are suitable for everyday use and can cater to the needs of different categories of professionals, including individual contractors, lawyers, real estate agents or health professionals. Available in grey with blue doors, these mobile drawer cabinets are a versatile storage solution that will help you save money and time that you would otherwise have to spend sorting and rearranging your goods and managing clutter. This product comes with a 1-year warranty on labour and a best price guarantee. Order yours today and we’ll deliver it to your door within 21 working days, free of charge.